There is an increasing lack of PC's with serial ports these days. Decoding data networks such as Flex, POCSAG and Mobitex on a computer without RS232 port is only possible using the PC's soundcard. A USB to serial converter in combination with a 2 level interface won't work. PDW doesn't use the normal RS-232 TxD/RxD lines, but uses the status lines (CTS, DSR, DTR). The 'abuse' of these lines for PDW purposes does not comply with the standard RS-232 protocol. If you have direct control over the serial port (i.e. through a physical port) you can sample these lines without a problem. If you use a USB to RS-232 converter, all serial communications goes through the converter's driver and PDW doesn't have direct control. Data communication protocols like Flex, POCSAG and Mobitex use synchronous communication: a steady flow of ones and zeros. An RS-232 port is made for asynchronous communication: start bit, data bits, stop bit. The serial interface presented here takes care of conversion. Share the interface data to multiple PDW windows. To do this, you need to use serial port splitter that will install multiple virtual COM ports. Apart from the bit synchronization, the interface doesn't contain any intelligence. The only thing the interface does is chopping a synchronous data signal into slices of 8 bits and sending these 8 bits asynchronously, i.e. packing them with start- and stopbits, according to the RS-232 protocol. 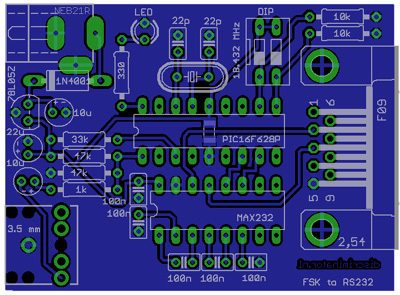 The new RS-232 interface [schematic] [partlist] is based on a cheap and common PIC16F627 or PIC16F628 microprocessor. It runs on a frequency of 18.432 MHz. This microprocessor has a built-in comparator ('2 level interface') and a hardware UART. To convert the output signal to RS232 levels (-10V / +10V), a MAX232 is used. A standard RS-232 output is implemented. 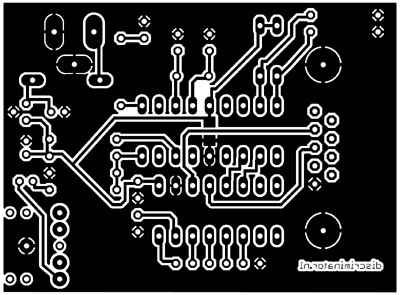 The circuit presented here only uses DIL (dual inline) components, making it easier to assemble the circuit board. Further to that, the circuit board is single sided, facilitating DIY production. Since October 2014, there is also a USB version of this interface available. Other data rates can be programmed on request. To use this interface, you should download the latest version of PDW (version 3.x). 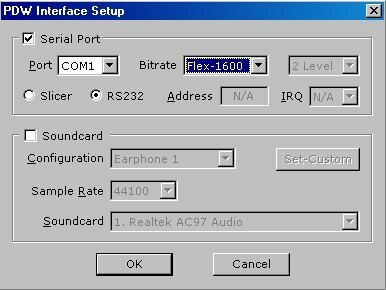 In the 'Interface' settings in PDW from version 3.0, the user can now choose between 'Slicer' (the 'standard' 2 or 4 level interface) or 'RS232' (the new serial interface). It takes some getting used to this: changing between different data standards requires the user to change the settings on both the interface and in PDW. The manual of the interface can be found here. Since its introduction in September 2010, several hundreds of interfaces have found their way to satisfied users worldwide. Early 2018, this interface has been discontinued. Its successor, the USB interface, remains available.